HELEN and Bindu are history. Now, it is the age of Isha Koppikar and Malaika Arora. They make Helen’s hot numbers seem like the dance steps you were taught in nursery school. Gone are the days when dance in mainstream Indian films was the kind you watched Vyjayantimala perform in Jewel Thief or much later, Hema Malini’s sensual number in Sholay. Helen’s dance was a direct import from the cabaret in a much-diluted, Indianised version. But now, Isha Koppikar’s Khallas number in Company and Ishq Samandar in Kaante have brought forth a completely new way of dancing, perhaps triggered off by Malaika Arora’s Chhaiyan Chhaiyan number in Dil Se. Item number is a new genre that has also created a niche for nubile stars who do not blink when asked to gyrate stripped down to the bare essentials in front of the camera. Says Helen, who started the cabaret trend in Indian cinema, "Today’s young girls are doing a brilliant job not only as actresses but also as dancers. Aishwarya and Karishma are talented actresses who are also brilliant dancers. Madhuri Dixit was equally good in dance numbers. I have no problem with item numbers because it is necessary for everyone in the entertainment industry to keep pace with time." 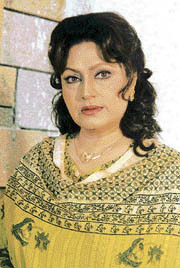 Having established her credentials over a span of 25 years, Helen remains the unanimous choice among the 10 best dancers Indian cinema has ever seen. She has even had a documentary made on her career by an eager fan. Helen’s Mera naam chin chin choo in Howrah Bridge in 1958 was the turning point for dancers with oomph. Padma Khanna, Bindu and Madhumati followed in her footsteps with great success till a funny thing happened. 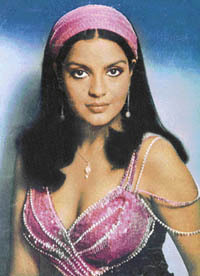 Leading ladies merrily joined the picnic to do raunchy numbers beginning with Zeenat Aman and Parveen Babi. Regular dance numbers too began to be choreographed like item numbers. Madhuri Dixit turned such numbers into a fine art form with her Ek do teen in Tezaab followed by the extremely popular Dhak dhak karne lagaa in Beta and then the Choli ke peechhey kya hai in Khalnayak. Urmila Matondkar is another excellent dancer who has now shifted to diverse roles. Raveena Tandon did better as an item number dancer in films than as an actress. Her Sheher ki ladki and Ore ore catapulted her to heights where she could pick and choose her films and her roles. Sushmita Sen with her sizzling Mehboob mere number in Fiza finally caught the attention of filmmakers and did a jig in sensuous sari-blouse outfits in Main Hoon Na. Shilpa Shetty has also done quite a few item numbers in her career. Says Ganesh Hegde, noted choreographer of item numbers such as Khallas, Kambakht ishq, Mehboob mere, Tere bina and Babuji zara dheery chalo, "I would define an item number as something senseless that is not related to the film. It is like a break in the strenuous activity of watching a Bollywood film. People can enjoy the naach-gana, clap, throw money and then get back to the tension of the actual film. Pyar Tune Kya Kiya was watched because of the Kambakht ishq number." He adds that top heroines today are vying for item numbers because "it increases their song bank. It gives them more money within limited time; there is no dubbing work, no shifts and sometimes it is shot within four or five days. But the biggest factor is the popularity it brings them. It gives them more recognition than ten films put together. No one noticed Isha till she drew the audience like a magnet with Khallas." Malaika butts in to say, "A large section of the audience today goes to the theatre just out of the curiosity generated by an item number. I love to dance. It is a passion with me. I am not really interested in an acting career right now." The item number has come to stay. Trade analyst Komal Nahata says Aishwarya Rai charged Rs 75 lakh for the Ishq kameena number in Shakti. Madhuri Dixit wore a short skirt for her Makhna number in Bade Miya Chhote Miya though it was not exactly an item number. But it drew attention to her all the same. "Item numbers are used to improve the commercial prospects of a film in the market and break the monotony in the narration. When producers spend so much to market the film, the next best thing they can do is to rope in a big star for an item number," says Nahata. Ram Gopal Verma, who turned sizzling dancers into an aesthetic creation with Rangeela, has since shifted focus on more dramatic matter. "My films attract audiences because of the scripts and performances, not because of the songs. In fact, Road lost out because the songs diluted the tense storyline," says Verma.